I thought about the issues surrounding the purchase of a Jeff Koons sculpture for the outside of the new downtown Sacramento sports arena and a part of me finds it hard to believe that I am set against it. It is quite clear to me that Sacramento needs more Red Rabbits, not fewer, after visiting Chicago and seeing how that eternal city continues to add to its outstanding collection of public art. My conclusion, however, is that Koons’ piece from the Coloring Book series is not the right work for Sacramento — and the price of $8 million proves it. And I do not think it is too expensive at that price — it’s too cheap. Take an immediately accessible work like the oversize Balloon Dogs. (Instead of stealing pictures from the Internet, I simply send you to Koons’ own website.) Shiny, colorful and designed to amaze anyone from a child to a tot’s great-grandparents, the metal dogs promote the desire to experience, to touch, to (ugh!) take a selfie. “I was there, I touched it, my fingerprints are on it, I saw it.” For a city without a wealth of public art on the massive scale that inspire immediate interest, a major piece that promotes that sense of joy, wonder and curious recognition is vital for the downtown revitalization (like the accessible Red Rabbit — an airport masterpiece that even ties in to the art in the other terminal as the bright beast jumps into its mysterious suitcase). A Balloon Dog, or similar Koons work, would do it. The price tag: pay $58 million for the orange dog. And that puts the Coloring Book sculpture into perspective. People say: “It’s such a deal. It’s a bargain at that price!” Why? Why is Koons offering the work at the Dollar Store art gallery price of $8 million when other Koons works sell for far more? Could it be that this Coloring Book series, although probably similar in cost to produce materially, is recognized by the art world as inferior in quality to some of Koons’ other sculptures? Is this the series Koons wants to make, but cannot get rid of? Like much of his work, it suggests a certain “screw you” mentality, as if we are purchasing a work that took little creativity and is just a child’s attempt at art. Are we just the Cowtown rubes to buy it? Finally pawned off that idea on the Sacramentans? A refrigerator door concept for his supposedly first municipal artwork — great stuff for a three year-old. The Sacramento Bee begged the city council to “overcome politics” and vote for the acquisition. I say politics had nothing to do with much of the opposition, just the ability to recognize an art world huckster who has made some quirky wonders and some absolute bombs (Made in Heaven — really?). I approved of the “open competition” idea. Is the next Maya Lin out there waiting to create something for Sacramento? Maybe they can make a real “iconic piece,” which Coloring Book is not, with the remaining art budget and save the arena public art from “banality,” to use a Koons phrase. For that matter, if we as a city are so interested in purchasing a Koons-style work based on the banal, why not just ask an artist to create an 18-foot high sculpture of a shiny metal golden spike? Shove it in the ground, point it to the sky and call it good. There, I can design a Jeff Koons sculpture too and mine has a sense of the Sacramento history others are clamoring about. Just pay me the cost of materials, construction and installation, and a dollar for the thought, and I will call it my civic contribution to the arena plan. That way you cannot accuse me of pulling the Piglet over your eyes. 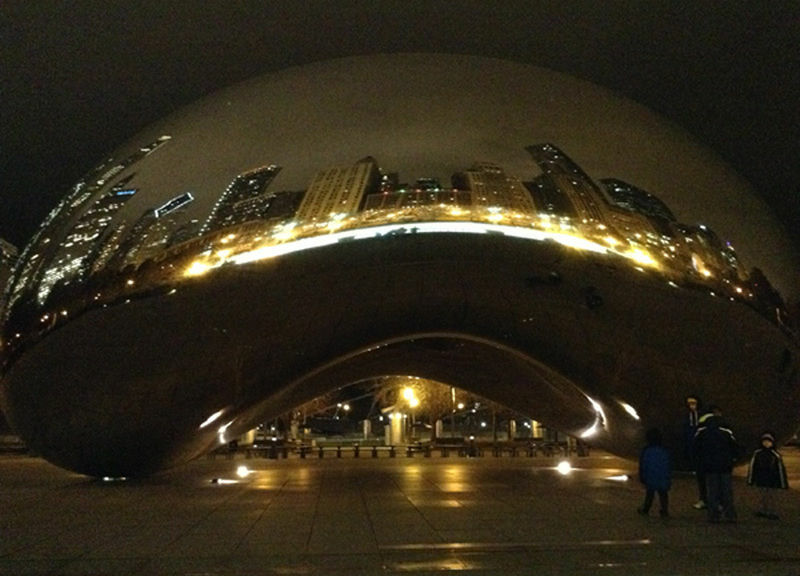 If you really want to know what I think, visit Anish Kapoor’s Cloud Gate in Chicago, commonly called “The Bean” (and shown above). Vivek Ranadive should have mentioned this artist first for Sacramento and elicited his help in creating a work that will do for the new arena what Cloud’s Gate does for Millennium Park. For that matter, check out Jaume Plensa’s Crown Fountain for an example of a truly crowd raising public artwork. Also, the Red Rabbit is technically called Leap, by Lawrence Argent, and only cost a “staggering” $800K. I would pay him to do something similar again. The other nationally noted suitcase-piece at the Sacramento Airport is Samson by Brian Goggin. Sniffing out the best things in the world of art.